The Mexican prairie dog weighs about 1 kg (2.2 lb). It occupies deep rock-free soils in open plains and plateaus of inter-montane valleys. These flat areas are covered with herbs and grasses and usually surrounded by mature desert vegetation. It occurs within an altitude range of 1600 - 2200 m (5250 - 7200'). The Mexican prairie dog eats herbs and grasses. It is diurnal and terrestrial and lives in "towns" (colonies) where it excavates elaborate burrows for shelter and protection from predators. These towns may contain hundreds of animals, depending on habitat availability, but currently many towns only include 50 or less animals. There is generally a single dominant male in the town. In 1956, the Mexican prairie dog was reported to occur in southeastern Coahuila, adjacent parts of Nuevo Leon, San Luis Potosi and probably in Zacatecas, Mexico (IUCN 1968) . By the 1980's, it was apparently confined to an area of less than 800 sq km (310 sq mi) in southern Coahuila and northern San Luis Potosi in northern Mexico (Burton & Pearson 1987) . Habitat loss due to agriculture and cattle raising activities is the main reason for the Mexican prairie dog's decline. 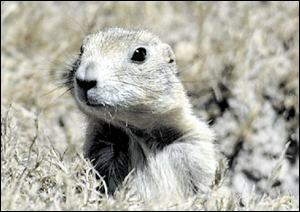 It has also been hunted by man for food and sporadically poisoned by local residents, since the prairie dog is considered to be an agricultural pest. *** The Mexican prairie dog is the southernmost species of prairie dog. 2004: Occurs in Mexico (IUCN 2004). Female Mexican prairie dogs weigh about 0.9 kg (2 lb); males weigh about 1.2 kg (2.6 lb). The Mexican prairie dog occupies deep rock-free soils in open plains and plateaus of inter-montane valleys. These flat areas are covered with herbs and grasses and usually surrounded by mature desert vegetation. It occurs within an altitude range of 1600 - 2200 m (5250 - 7200'). 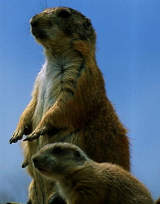 The Mexican prairie dog's breeding season lasts from early January through April and possibly to late July. Females have one litter per year averaging 4 pups. The Mexican prairie dog eats herbs and grasses. The Mexican prairie dog is diurnal and terrestrial. It lives in "towns" (colonies) where it excavates elaborate burrows for shelter and protection from predators. Prairie dogs live in "towns" (colonies) which may contain hundreds of animals, depending on habitat availability. Currently many towns only include 50 or less animals. There is generally a single dominant male in the town.